99club: 200 XXL images for one year for $99 – yearly download limit. Use the promo code “morespin” to get 20 bonus downloads! Low Volume: 600 XXL images for one year for $199 – yearly download limit. Use the promo code “morespin” to get 20 bonus downloads! For more details, visit Stock Photo Secrets Shop! If you still want to learn about the service they offered, keep reading our Photospin review below. But you are interested in alternative stock photo agencies that are still running, we recommend Stock Photo Secrets Shop, which has two amazing Photospin alternatives: the 99club plan with 200 XXL images for a year for $99 – and the limited-time Low Volume deal which has 600 XXL images in one year for $199! 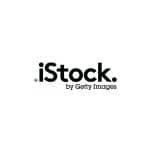 These are very low priced, flexible and reliable offers to buy Royalty-free stock photos, and if you liked Photospin, you sure will love them. Stock photos are one of the most versatile tools available online. From images you can use to make your website more visually appealing to visuals that can accompany social media posts and gain the attention of your followers, stock photos provide you with the opportunity to engage viewers and draw more business to your company. As a result, a thriving business has grown up around providing stock photos to companies and individuals, with dozens of providers offering everything from a subscription model to a lifetime membership to a pay-per-photo service. Of all the stock photo services available on the internet, however, PhotoSpin provides the best value for its cost, and offers several helpful features that will aid you in finding the photos that work best for you. Headquartered in San Pedro, California, PhotoSpin was established in 1996 by a group of creative professionals with backgrounds in photography, graphic design, advertising, and film. The driving force behind the company is the mission of providing quality imagery and making sure that “all creatives have quick access to good content at an affordable price,” according to their website. The company started out building over 60 CD-ROM products and loads of content for other publishers, and later transitioned to offering images online as individual downloads. PhotoSpin photos were licensed and promoted the work of other artists and photographers, at the same time as they offered special products in the Premier Series. Eventually, PhotoSpin became the first creative-content subscription site for professionals when it launched for the first time in September 2000. The site adds new images each month and has three goals: to help people save time, save money, and organize their images online. Today, the site contains over 2.3 million images, and adds up to 50,000 new photos and illustrations each month. The company’s library also includes system fonts that you can use for your website or any documents that you may want to create. Several file types are sold on PhotoSpin, including photos, vectors, and fonts. The company accepts payment via PayPal and Visa, American Express, and MasterCard, and also provides multi-seat licenses for $49.95 for each additional person added to a subscription, making it easy to add collaborators to a project instead of having them create their own accounts. 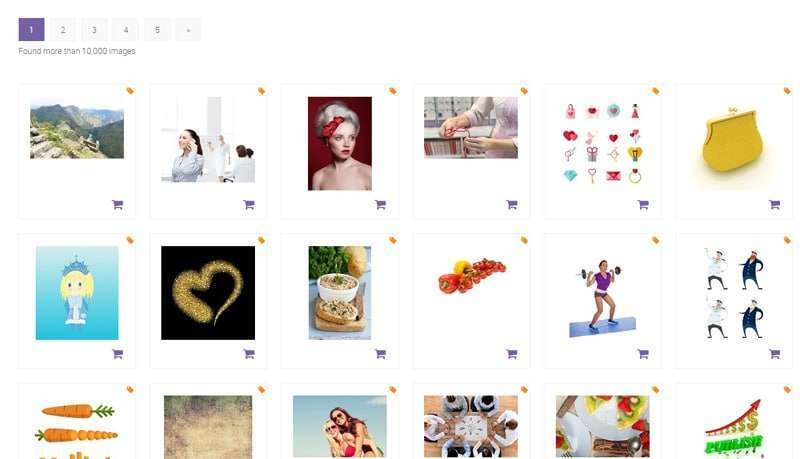 PhotoSpin offerings are searchable by keywords, categories, collections, file types, artists, and orientation. The site also offers tutorials on programs such as Adobe Photoshop, InDesign, and Illustrator in the PS Labs section of the site. International languages are available for those accessing the site from outside the United States. PhotoSpin’s main service centers around two subscription types, the Super Plus and the Plus subscriptions, both of which are offered on an annual basis with monthly payment options. 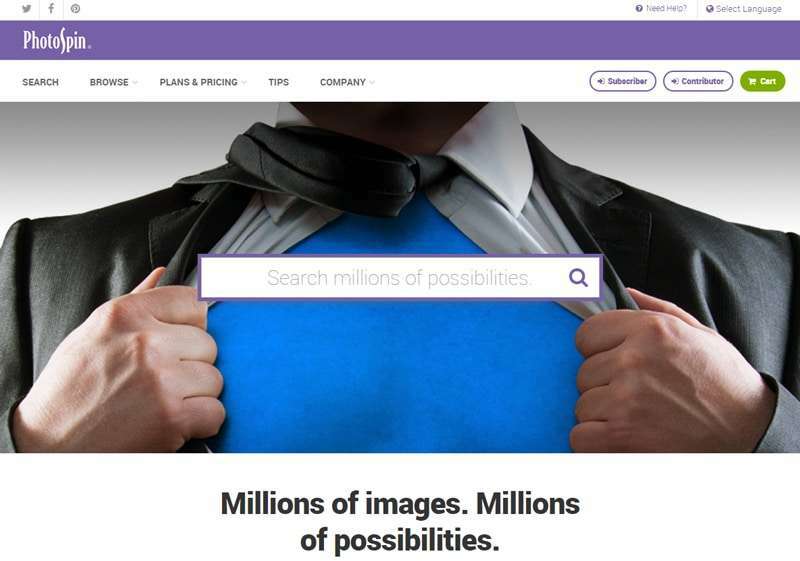 The difference is in their file size and image access: while the Super Plus subscription offers images up to 17 inches long at 300 ppi, the Plus subscription is for smaller images – up to 12 inches long at 300 ppi. The main reason for the difference is the various needs of different creatives; for example, bloggers who don’t need large images won’t have to overpay for these images and can instead opt for the Plus subscription model. 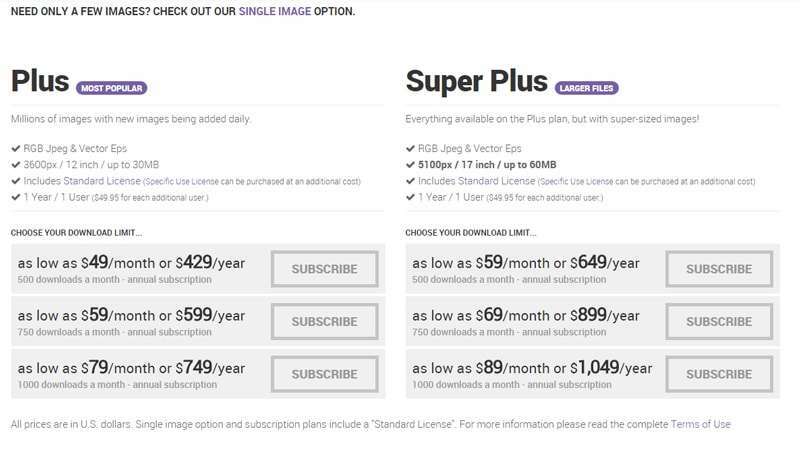 The Plus and Super Plus subscriptions are then further divided based on the number of images you need: you can choose from 500, 750 or 1000 downloads per month for each type. This is especially convenient for those who either need more or fewer images for their websites or businesses. Payments can be made either annually or monthly, with costs as low as $49.00 USD per month or $429.00 USD per year for the Plus subscription model at 500 downloads per month. As a result, paying for an annual subscription is more cost-effective than paying per month if you plan to use the service for at least a full year. Other options include the Plus model at 750 downloads a month for $59.00 per month or $599 per year, and 1000 downloads a month for $79.00 per month or $749 per year. The Super Plus model comes at 500 downloads a month for $59.00 per month or $649 per year, 750 downloads a month for $69.00 a month or $899 per year, and 1000 downloads a month for $89.00 per month or $1,099 per year. All images come in RGB JPG and vector options. Finally, the website offers single-image purchases that also vary in size and price. Options include a Small JPG of 2.5 inches at 300 ppi for $2.00; a Screen JPG of 14 inches at 72 ppi for $4.00; a Medium JPG of 6 inches at 300 ppi for $8.00; a Large JPG of 12 inches at 300 ppi for $20; a scalable vector EPS for $30; and a XLarge JPG of 17 inches at 300 ppi for $30. The images are desktop and mobile optimized, giving you the flexibility to post them on multiple platforms without worrying about how they’re going to turn out. You also get the benefit of faster benefits with new Cloud delivery options so that you can receive images instantly. The updated PhotoSpin website uses a new Azure search index to help you find the images you’re looking for more quickly and efficiently. You can filter the search results to display vector images only, or any other file type that you’re looking for. You can also use the built-in spelling and thesaurus correction function, which makes sure that you get the search results you intended to find even if you misspell a word. You can also choose to sort your search results by best match, similar, newest, popularity, and trending, meaning that you can narrow down or expand your focus as you see fit. The main licensing option offered by PhotoSpin is the royalty-free license, although you can get specific-use licenses if you require them for your work. Specific-use licenses allow the images to be used on products for resale; you can negotiate the terms of your licensing agreement through email or by placing a call to PhotoSpin’s licensing department. PhotoSpin’s annual subscription services will provide the most benefits for stock photo buyers who want to use a large amount of images. The two subscription options, which are determined by the size of the images, allow everyone from bloggers to designers to make use of the company’s offerings in a way that meets the company’s three main goals: save time, save money, and organize images online. The timesaving feature comes with the lack of payment hassle and the one-time subscription model, which allows you to sign up once and download images whenever you like for a year after you subscribe. The two subscription types offered ensure that you won’t have to overpay for the images you download, and instead provide a significant deal on the price per image compared to other companies; the more you download, the more you benefit. Finally, custom light boxes allow you to search, save and quickly manage your content online, making PhotoSpin easy to use and a good option for those who have multiple images to deal with each day and want to be able to access them on demand. One drawback is that if you don’t donwload very many images, the subscription option may not turn out to be very economically efficient, as you may be better off just paying for each image as you need it. However, this is up to you to determine whether you will need the number of images that PhotoSpin offers or not. Furthermore, additional licensing options require negotiation with the owners, and are not included in the subscription plans offered by PhotoSpin. All images are royalty-free only, which means that PhotoSpin is limited in the number of images it can offer; for example, the site cannot provide an image by a photographer that has not made his or her image available for commercial use without further royalties paid. PhotoSpin has an informative website where you can find out more about the services and products they offer, as well as sign up for their subscription services or download single images as you see fit. The site also publishes helpful articles on image use, and has a list of tips and tutorials for designers and creatives looking to use stock images in their work or websites. Their news section provides information about the state of the industry and any important facts you need to know about programs and tools such as Adobe Creative Suite or PhotoSpin itself. PhotoSpin is also offering a free one-month trial, so if you’re wondering about how this company may benefit you, go ahead and try it out!